The diving board, also known as a springboard, is a classic swimming pool fixture. Diving became an Olympic sport in 1904 and many different styles of diving have been invented over the years. Obviously, with the advent of man-made swimming structures, diving has become easier and safer for all to enjoy, but there is no real way to determine when mankind began to find enjoyment in jumping into bodies of water. For safety, it is required that diving boards only be installed on swimming pools that are 11.5 feet deep at the point directly below the tip of the diving board. This rules out above ground swimming pools. As always, when swimming, it is of the utmost importance to use as much caution as possible. Swimming pools aren’t all fun and games – there are a variety of other reasons to become a pool owner! 5. Improves flexibility. Swimmers of all ages can improve their flexibility with regular swims. This is an especially enjoyable way to exercise for people who suffer from arthritis or stiff joints. Since water is about twelve times denser than air, it is able to support more of your body’s weight, making it easier to be active. 4. Builds muscle tone. On the same note, the increased resistance of water, as compared to air, can help build muscle tone in dedicated swimmers. Resistance exercises are well known as a great way to build muscle tone. 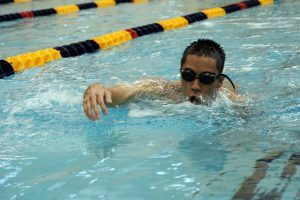 So if you’re looking to improve your physique, swimming can actually be more efficient than jogging or other popular exercises. Any swimming pool would be nothing without a pool liner. The purpose of a swimming pool liner is to create a waterproof container for you to swim in. Pool liners are often made of vinyl, which can be quite durable; however, in sunny climates like California, vinyl swimming pool liners only last about 7–12 years. You can tell when your pool liner will wear out because you will see cracks that must be patched if you are delaying the inevitable pool liner replacement. This effect is from heat and abundant sunshine. To protect the swimming pool liner from sharp rocks, vegetation, and other external influences, a layer of padding is usually installed first, often made of foam. You should always be careful about the items you allow inside your pool as well, as punctures or damage to the pool liner will result in leaks. For many swimming enthusiasts, pool steps are the ideal place to relax without leaving the water. Whether your pool is above ground or in ground, the right set of pool steps or ladders pools can make a huge difference, especially for children and elders. 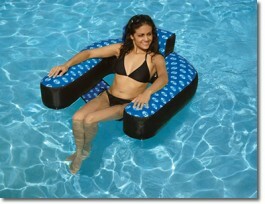 Many styles of pool steps are designed specifically to be a comfortable place to sit. This vantage point is perfect for relaxing alone with a good book or a nice glass of wine, for lounging with a friend or two to chat and enjoy beautiful weather together, or for safely supervising young swimmers in both the shallow and deep ends. Kids and adults agree – a good set of pool steps or strategically placed pool ladders can transform an ordinary pool into a relaxation haven. 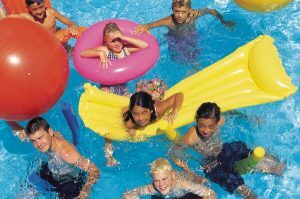 If your pool is visited often by children, especially in groups, you may want to consider installing multiple pool ladders in the deep end. Make getting in and out of your pool a breeze for everyone! 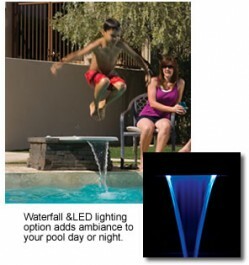 Swimming Pool Outfitters offers a complete selection of pool steps and ladders for all different styles and functions. Happy first day of summer! We’ve waited all year for the warm weather to return and it’s finally back. However, it’s as important as ever to make sure you’re prepared for the hot temperatures. Swimming Pool Outfitters provides everything you’ll need for a fantastic summer. Here are some great tips we’ve put together for pool season! Know your enemy. Hot summer days sound great when you’re freezing your feet off in the wintertime, but when they actually arrive, they can be a real drag. 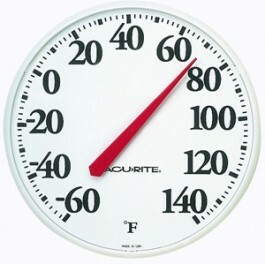 Keep an eye on the temperature with our poolside thermometer. The big 12- 1/2" face has oversized numbers for easy viewing from across the pool, yard, or even inside the house. The hottest days are no time to be doing manual labor around your yard when you could be cooling off in the pool instead! 01 Jun Turn Your Pool Into A Mini Water Park! Classics are classics for a reason. The most standard pool accessories only became popular because they are so enjoyable to use! Here are some suggestions for tried-and-true pool equipment that will result in hours of fun. Install a pool slide. 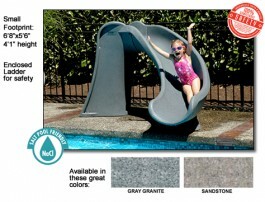 Slides are a great way to enjoy your pool for swimmers of nearly any age. Although it’s hard to replicate the huge slides at home, a small one is just as easy to enjoy (and you don’t have to worry about buying a ticket or finding a parking spot)! We offer slides meant specifically for in-ground pools as well as slides that are compatible with above-ground pools. Schools are finishing up the academic year soon, and kids everywhere will finally regain the freedom that comes along with summer vacation. Unfortunately, most adults don’t enjoy the same luxury. Here are a few pool safety tips to keep in mind this summer! Prepare for the worst. Always have emergency rescue equipment at your disposal. At the bare minimum, you will definitely want the basics, like a first aid kit and a life ring. Compile a list of phone numbers you might need in an emergency and keep them near the pool area. Springtime is here, and we all know what that means - time to get out the sunscreen lotion! Pool season is sun season. 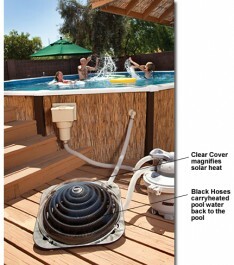 Here are some great ways to improve your poolside experience with solar power. Heat your pool. Sick of swimming with the icebergs? There’s no need to tolerate chilly waters when you can just let the sun warm your pool up! Solar energy is magnified through the lens of this pool heater, which can raise the temperature of your pool by up to five degrees per week! Once you start swimming in your very own heated swimming pool, you'll wonder what took you so long to invest in a heater! Even if you already have a pool heater, you may want to consider replacing it with a solar powered pool heater to cut costs on your electricity bill. Despite all the recent snowy weather in New England, there’s no denying that Spring is approaching. After all, we just set our clocks forward for Daylight Savings Time this past weekend! To make opening your pool as easy as possible, why not start preparing now? You’ve got plenty of time to make all the purchases you need, such as chemicals and equipment. Don’t forget to treat yourself to some new floaties or something fun! Here are a few more helpful tips for opening your pool up this Spring. 07 Feb What would you put in your poolhouse? As any pool owner can tell you, having a swimming pool requires a lot of equipment, maintenance, and accessories. That’s why poolhouses are so common among pool owners who can afford them. While a pool house may be just a dream for many, there’s no harm in dreaming, so today we’ve compiled a list of must-haves for the poolhouse of our dreams. Take a look! Childproof storage for chemicals. It is of the utmost importance to keep pool chemicals in a childproof place. Our ideal poolhouse would include a closet with a locking door for storing the chemicals that are necessary to open and close the pool and to keep it running smoothly. Exposing children and visitors to these toxic mixtures can result in horrible consequences, so there is no need to run that risk. Clean & Clear Pool Service, Inc.